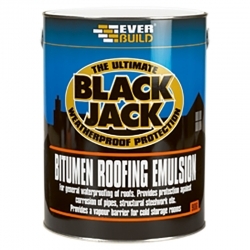 Specially-formulated for emergency roof repairs no matter how bad the weather; can even be applied under water. 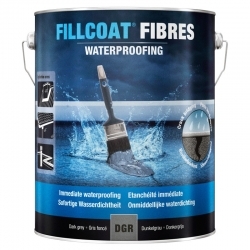 Ideal for roofs which need immediate repair to stop leaks. 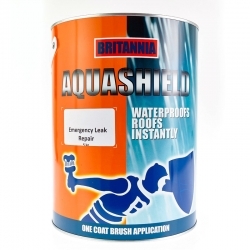 Britannia Aquashield Emergency Leak Repair seals and waterproofs roofs on a temporary basis however bad the weather. 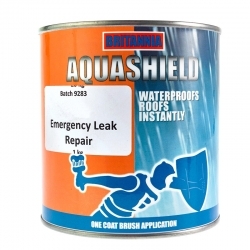 Cracks need not crack you up... with this emergency coating, you can patch them up. 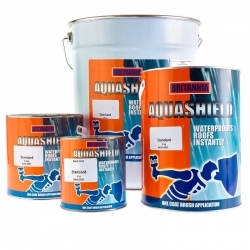 Suitable for almost any building you can think of, but is not suitable for wooden surfaces, tanking, fishponds or internal use. Prison - As any prison guard will tell you, prisons are challenging places; eyes and ears need to be everywhere. 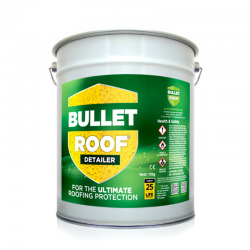 If cracks begin to appear on the roofs, they need to be fixed with the minimum of disruption, so that the security of the prison is not compromised. School - Cracks in roofs have the capacity to let water into the building. An instant patch is required to keep the school operating as normal. 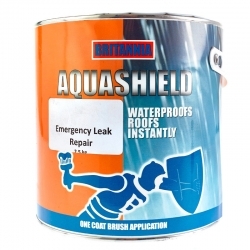 Britannia Aquashield Emergency Leak Repair is the solution to your problem in just such an emergency. Factory - Time is money. Money is time. 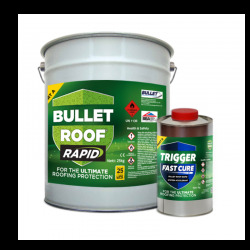 When cracks unexpectedly appear on the factory roof, there may not be time to perform a full fix. 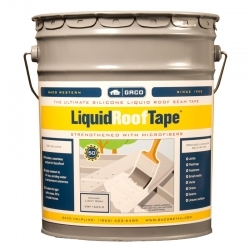 What you're looking for in this instance is an emergency fix; something that will fill-in the crack and provide waterproofing properties in the short term. 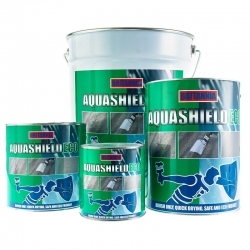 Can be applied in falling rain or even under water. 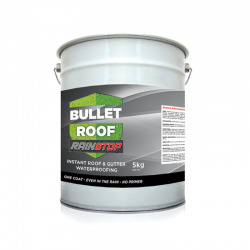 Suitable for all building surfaces. Dirt build up, moss and loose material should be removed by scraping or brushing. In cold conditions any ice present on the surface must be removed. 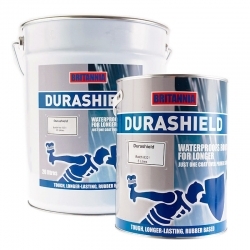 Britannia Emergency leak repair should be applied directly to the substrate, no priming is normally required. 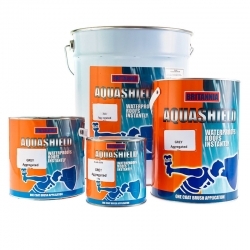 Application by a good quality brush, roller or squeegee. 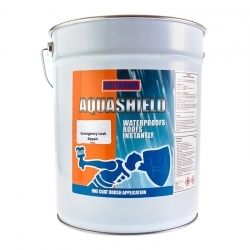 Best results are achieved when “Stippled” into cracks and rough surfaces. Apply liberally to bridge small holes up to 1/8” (3mm) and larger using Britannia’s Reinforcing Scrim. Good working practice should be followed and safety/ walking boards should be utilised where required. The specification and coverage rates are given in good faith and are based on the manufacturer's experience and knowledge but without liability. For all cleaning, use Britannia White Spirit. Drying time is up to 6-7 days depending on temperature and thickness of coating. 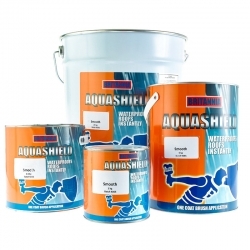 Supplied ready for use on all building surfaces which need immediate repair to stop leaks. A full check should be required at a later date as these repairs are considered temporary. 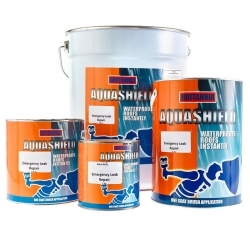 Toxic to aquatic organisms; do not use near fishponds. May cause long term adverse effects in the aquatic environments. Remove splashes from the skin with a recognised hand cleaner or plenty of soap and water. Ensure good ventilation during application. Wear gloves, goggles and suitable protective clothing. Flammable! Keep away from sources of ignition. Aquashield is not recommended for the treatment of wooden surfaces, tanking, fishponds or internal use. 1-3 kg per square metre depending on substrateand conditions. 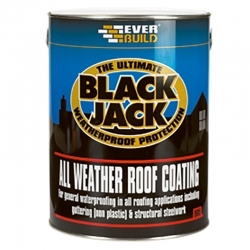 Hi will this product be OK to put over a plastic covering on a lean to. 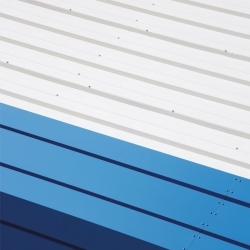 If the plastic is rigid and a reasonable thickness then it should be OK as a temporary, short term measure. If the plastic is thin sheet (tarpaulin or similar) then it would not be suitable.